Space may be big — vastly, hugely, mind-bogglingly big — but the space around Earth is beginning to get cluttered with space junk. This poses a threat, not only to other satellites, space stations and missions, but to us here on Earth as well. While we wrestle with environmental issues posed by human activity on our planet, ESA’s new ‘Clean Space’ initiative aims to address the same issues for its missions, making them greener by using more eco-friendly materials and finding ways to cut down levels of space debris. The workshop looked at all aspects of space missions, their total environment impact, from concept development to end of life. The impact of regulations regarding substances such as hydrazine, which is used widely as a propellant in space programs and the development of Green Propulsion with propellants that have a reduced toxicity. Environmental friendliness and sustainability often mean increased efficiency, which ESA hopes will give the industry a competitive advantage, so they are looking at technologies which will consume less energy and produce less waste, therefore cutting costs. Finally they looked at debris mitigation to minimize the impact to the space environment as well as the debris footprint on Earth using controlled and uncontrolled re-entry events and passive de-orbiting systems along with active de-orbiting and re-orbiting systems. They are even considering tethers or sails to help drag abandoned satellites out of low orbit within 25 years. New ‘design for demise’ concepts hope to prevent chunks of satellites surviving re-entry and hitting the ground intact. Active removal of existing debris is also needed, including robotic missions to repair or de-orbit satellites. 6,000 satellites have been launched during the Space Age; less than 1000 of these are still in operation. The rest are derelict and liable to fragment as leftover fuel or batteries explode. Traveling at around 7.5 km/s, a 2 cm screw has a ‘lethal diameter’ sufficient to take out a satellite. Taking the recent loss of the Envisat satellite as an example, this satellite now poses a considerable threat as space junk. An analysis of space debris at Envisat’s orbit suggests there is a 15% to 30% chance of collision with another piece of junk during the 150 years it is thought Envisat could remain in orbit. 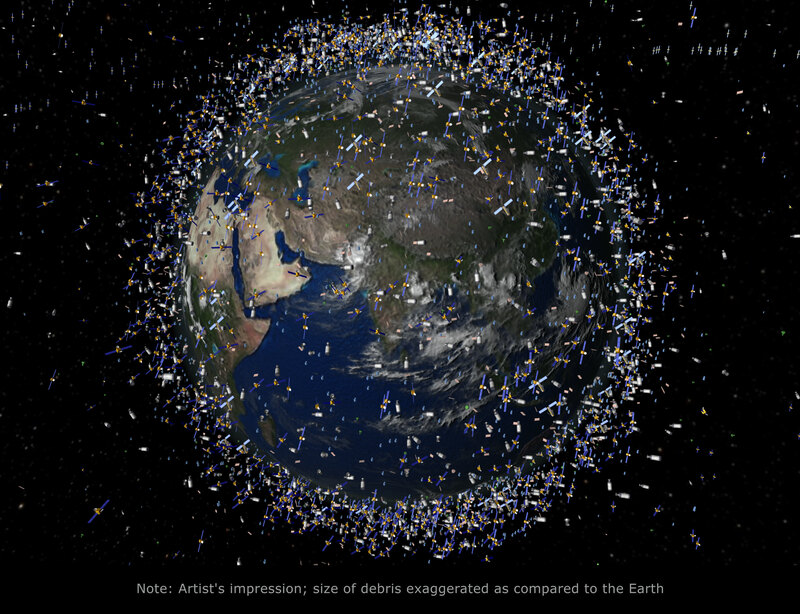 The satellite’s complexity and size means even a small piece of debris could cause a “fragmentation event” producing its own population of space garbage. Envisat is also too big to be allowed to drift back into the Earth’s atmosphere. The choices seem to be to raise the satellite to a higher, unused orbit, or guide it back in over the Pacific Ocean. Apparently Envisat is in a polar orbit. Could it not be ditched into Antarctica? Not that there’s any advantage to this over the Pacific, but I do wonder why Antarctica is never mentioned as an option. Can they recover anything from the satellites if they crash them in the Pacific? Cause if they can, that’s maybe the advantage. The private sector is already gazing at asteroids for mining potential. Surely there is a niche here for one of them to “mine” dead satellites so much closer to home. Precious metals and still-viable technology recovered are the two most obvious profit inspirations – I’m sure there are a lot more. Wonder what the legal complications of that idea entails..
Um, sorry, but how is this good? Uncontrolled deorbits are exactly what we don’t want! And don’t accuse me of trolling, because it’s a legitimate point, and i’m sure there are others who agree.